Reframing Racism – February and March Dates! 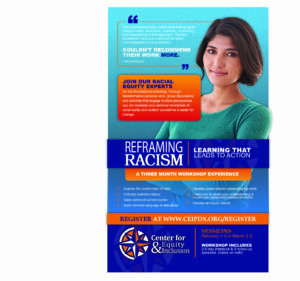 A transformative training designed to help folks become more racially conscious, culturally competent individuals who understand how racism operates and what we can do about it. This series consists of a 2.5 day intensive and 3 follow-up sessions. February 1-3: Wed(9-5pm), Thurs (9-5pm), Fri (9-2pm) with follow ups occurring on Wednesdays from 6-9pm (Feb 22, Mar 15, Apr 12). Claim your spot today! $195 deposit. All materials included.